These age groups used to play 11 v 11 on adult-sized fields with adult- sized goals. Some of the less skill-developed players could play a whole game with only a few touches of the ball. The "11 v 11" game encouraged inappropriate early specialization. The move to 8 v 8 soccer at this age group means more touches on the ball, more skill development and less specialization. U11 and U12 players play on half-sized fields. In "8 v 8 soccer", all players touch the ball much more and basic skills are developed. At U11 coaches are expected to organize their teams in ways that foster player development rather than simply "to win the game". 2. When registering, choose the option "any level"
4. Will be expected to attend the Club's "Plus" program on Wednesdays to train with the Professional Staff as well as practicing once per week with their team coach. It should be noted that players not chosen, or not choosing to play on the Development team will still be eligible and considered for placement at the Select level in the U12 age level. We are fully aware that players develop at different ages and at different rates. The Club will make every effort to keep the current teams together based on the players requests at registration. A few teams may need to be combined. All girls not chosen for the Development teams or not willing to play on a Development team will be interlocking with teams from VYSA (Vancouver Youth Soccer Association). All GU12 gold level players will be expected to attend the Wednesday PLUS program to train with the Professional staff. Some additional players from Silver teams will also be invited by the Head coach into the program. Once the girls reach U13 they will be streamed into Divisions and will all play in the BCCGSL (BC Coastal Girls Soccer League). They will transition to a full size field and goals and play 11 - aside. This is also the first year introduction to the Metro Soccer League (MSL). MSL is the top level of Club play for players U13 to U18. Teams from around the Lower Mainland and Vancouver Island comprise the teams that compete. MSL is a highly competitive league that focuses on developing players for the possibility of advancing to the next and highest level of soccer, British Columbia Select Performance League. Players from outside of WVSC are welcome to be assessed for one of the club's MSL teams. Please register for tryouts on the WVSC web site under "registration" and then "MSL evaluations". The girls will continue to play within the BCCGSL with 11-aside all the way to U18. The long term player development training at U14 leans towards position specific training and continues into U15 and beyond with the addition of refining skills and specific physical and mental training. At the start of season fields and game times are assigned to teams but can change at the BC Coastal Girls Soccer League Post Thanksgiving Re-Alignment. Teams are assigned from Under 18 down pairing "like" -number of teams in a division to make the field pairings. Every attempt is made to keep same times as at the start of the season but it is not always possible. Teams should be aware that their home field can change i.e. artificial turf moved to grass. If you are unsure of who to contact, please contact your Age Group Coordinator (AGC). Most questions or concerns can be addressed by AGCs. If they cannot provide you with an answer they will forward any questions or concerns to the appropriate Club official. Please DO NOT go directly to our Technical Department for concerns regarding your team. Our Technical Director and Staff are available to provide you with technical advice and support only. Although our staff coaches might have a sympathetic ear for your situation, ultimately they are not the people who will assist you in most cases. We do not want to discourage open relationships amongst our Club members and officials, but in order for us to work as efficiently as possible we need everyone to adhere to these guidelines. All Club officials, including AGCs, are listed on the WVSC web site Click here for all current WVSC contact information. Field should be setup using existing divisional sideline as per diagram. 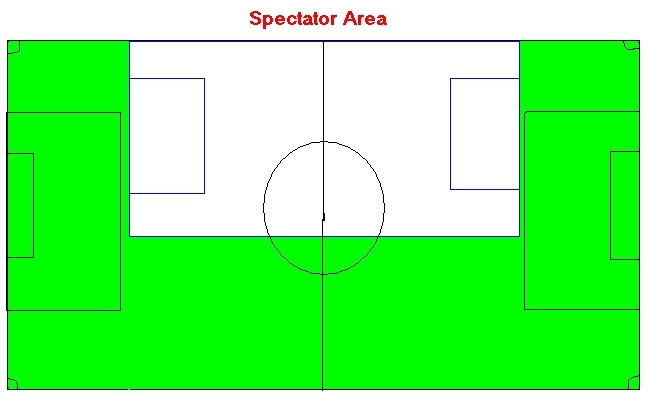 Spectators are not to be in the green area. Grass/Gravel field to be lined with woz cones. First team on sets up the goals and cones, last team on puts the equipment away. Check the WVSC Field’s Line, 604-926-6863 after 1 p.m. on Friday’s to see if your grass field is open. If closed move to your assigned all weather alternate at the same time – call your opposition. If your field is open on Friday but you arrive at your game on Saturday or Sunday and there is standing water (puddles) or soft spots (when you walk you hear water squishing) or frost on the field - you must move to your all weather alternate. Set up the field as per attached field diagram. avoid goalmouths and alternate sidelines each week, i.e. use north sideline one week, south sideline the next. pace out the field, using one pace per metre, mark it with a wos cone. mark the field perimeter, the penalty area, the 20-yard “offside” lines and the centre line.